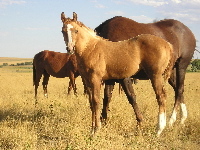 We have 5 colts and 1 filly for sale from our 2007 foal crop. They have all been halter broke, trimmed and are now out in summer pasture just being colts and growing up. 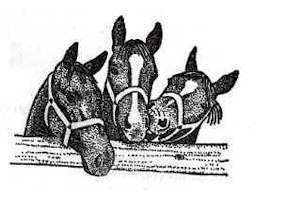 Sister .to saddle & money winning team roping horse & calf roping horse. The 5 stud colts are by Forty Two King. 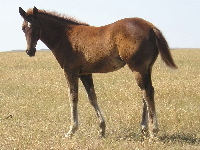 Forty Two King is a linebred King P234 stallion that traces to King 13 times. He is 42% King breeding and looks a lot like King. He passes on the wonderful King disposition and athletic ability to his foals. He has produced ranch horses, rope and rodeo horses and youth horses. The palomino filly is by Hatcreek Bailey. Hatcreek Bailey is a black great grandson of Leo and a grandson of Chieflika. He is a 1/2 brother to many good rodeo horses that have won in team roping, calf roping, barrels, poles, goats and queen contests. He produces gentle colts with outstanding dispostions. He has produced ranch horses, rope and rodeo horses and youth horses. This filly is by Alamitos Sun Frost. 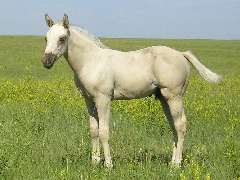 Alamitos Sun Frost is a cremello son of Sun Frost. This colt is by Mr Lonesome Leo. Mr Lonesome Leo is a palamino with Joe Reed & Leo breeding.